“Yet many outside observers, particularly those in the private sector, are skeptical that these groups accomplish much. I found out about it on June 2 when a Red Hat vice-president chastised me for claiming to represent Red Hat to the press. My email signature at the time said I was a Red Hat employee, but I did not claim to represent Red Hat when I answered that query. Red Hat is welcome to any comments I make, but this is my blog, hosted on my own equipment on my own time. The article allowed comments, and so I gave the reporter an electronic ear full of grief for quoting me out of context. And then I posted my entire response to his query. Lesson learned. Be careful about word choices. I never went back and looked for that article until tonight while writing this blog post, three years later. It’s not there anymore. Maybe the publication pulled down the offending article because it was dishonest. I still have the vice-president email, and I used it as source material for this post. I bring up all this history because three years later, in mid-April, 2019, quoting-out-of-context is in the news. 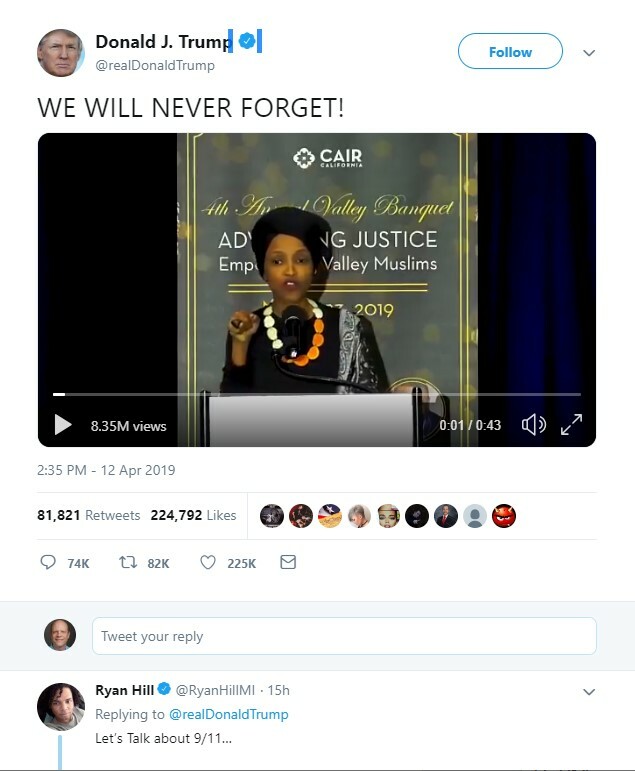 And, so President Trump’s team wrapped 43 seconds of 9/11 video clips around that fragment, with the implied message that Omar tried to minimize the horrible events of 9/11/2001, and tweeted it to the world. I posted it around 6:00 PM on April 14, 2019. Shortly after midnight, my post had 2096 impressions and climbing, 41 likes, 8 detail expands, 7 replies, 4 profile clicks, and 3 retweets. It’s been a lively discussion. I waded into this because, as a writer, I’m supposed to stand up for truth. Even with fiction, what good is it if it doesn’t illustrate some element of truth? And when we take words out of context and try to assign a different meaning to them than what was intended, it’s just plain dishonest. I’ve been the victim of it and I don’t like it. Anyway, after I tweeted my tweet, I took the time to view her whole speech on Youtube, about 20 minutes. The speech is about equal rights and discrimination to a room full of Muslims. Here is the complete relevant sentence. And here is a link to her whole speech. Skip past the first two minutes of marketing fluff. We can argue about her choice of words. Maybe she should have said, “did some terrible things.” But she was not defending the 9/11 terrorists, she was calling for mutual respect and understanding among all Americans. Seems to me, that’s a worthy goal. Mr. President, if you want to criticize an opponent for policy issues, that’s fair game in American politics. But when you use an opponent’s words out of context, you really only hurt your own cause, because, sooner or later, you’ll get caught. How are we supposed to trust you when you pull rinky-dink 6th grade tricks like this?